In late 2008 or early 2009, a ship from somewhere in the Caribbean pulled into the Port of Miami. It was carrying the usual goods along with a dangerous stowaway: the Roguse Spiraling Whitefly. Since first being reported in Miami in March of 2009, this insect has worked its way north, and has now caused destruction as far as the north end of Ana Maria Island. More than 1550 types of whiteflies exist in the world, and about 75 have caused problems for Florida homeowners. According to Buck Moon, a certified pest control operator in state of Florida, whiteflies of various types can wreak havoc on many types of ornamental plants including palms, white birds of paradise, copperleaf, fruit trees and many others. He said the Roguse Whitefly is particularly troublesome. One of the ways that whiteflies cause damage is by attaching to the tree and sucking all of the nutrients out. Obviously, the larger the infestation, the more nutrients the whiteflies require. Moon pointed out another method of destruction caused by the Roguse Spiraling Whitefly in particular. Moon said this mold, often called sooty mold, is dark in color. In addition to harming the trees and plants, this sooty mold also causes damage to the often light colored driveways and walkways of Florida homes. As the sooty mold drips onto the pavement and driveways it causes dark stains which often cannot even be washed away with a power washer. Moon said that treating for whiteflies is a daily occurrence for him, and he stresses the importance of early intervention to prevent damage. Moon said that while the government is working on ways to combat this new enemy to Florida lawns, that it is still very important that homeowners learn the early signs of whitefly infestation so that they can best protect the investment they’ve made in beautifying their yards. Detecting a Roguse Spiraling Whitefly – or any other type of whitefly – infestation early is important in order to minimize damage and prevent growth of the infestation. Possible signs of damage include yellowing, wilting, leaf drop and death. Instead of waiting until damage has occurred, consider regularly inspecting your ornamental plants so that you will see the signs of an infestation before damage occurs. Whether you catch the problem at the first sign of an infestation or if damage has already occurred, it is important to start treatment as soon as possible. Because a larger infestation means more damage and is harder to treat, starting treatment right away is hugely important. As mentioned above, the Roguse Spiraling Whitefly has no natural predators in the United States. Left untreated, this infestation can only grow and cause more damage to your Florida lawn. Many homeowners prefer natural treatment options. While this is understandable, it is not the best course of action for a whitefly infestation. There are several reasons for this. According to a report by the University of Florida that was published in 2010, the misuse of home treatments or insecticides can cause further problems such as killing other insects that are beneficial to a Florida lawn. 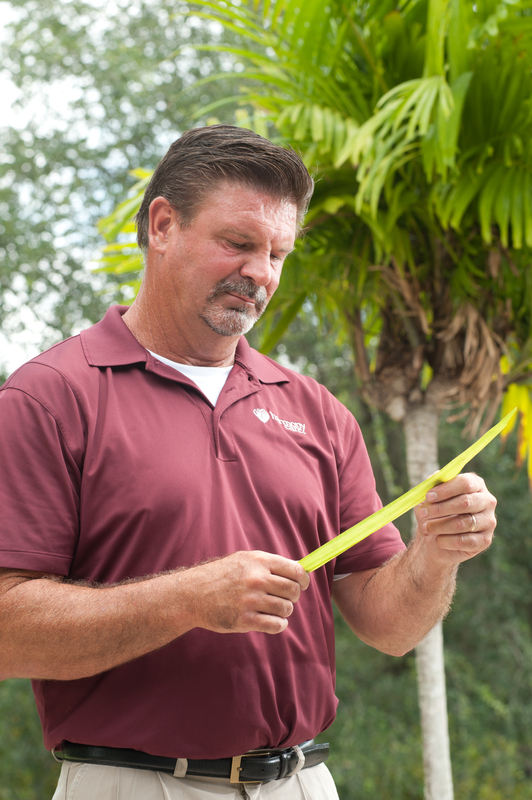 Some impacted trees are simply too large for a homeowner to treat on their own. If a treatment method is ineffective on the type of whitefly that is damaging your plants they will have more time to grow their population and be more difficult to treat down the road. Instead, you should call a professional as soon as you detect any type of whitefly activity. Possible treatment methods include drilling into a tree to deliver insecticide, spraying the leaves directly or drenching the roots. A certified pest control specialist will be able to positively identify the type and size of a whitefly infestation and develop a treatment plan that will stop the problem without causing unnecessary side effects. Whiteflies don’t have to be the end of your lovely Florida lawn, but early detection and treatment is essential.